Did you know that Instagram users don’t see 70% of the media on their feed? Meaning that unless users specifically look up your Instagram hashtag, there’s a good chance they’re not seeing what you post. And meanwhile, everyone else is working their hardest to be a part of the other 30%. Brands especially strive to fit themselves into social networks, which were originally designed for personal interactions. How can a large corporation both frame itself as a worthy and elite brand and yet still connect back to its loyal fans and followers? Frequent Instagram users know how powerful a hashtag can be for their personal Insta experience. It connects them directly to the content that they want to see. And as a brand, you want to be that content. With 7 out of 10 hashtags now being branded and posts with at least one hashtag having 12.6% more engagement than those without, the hashtag is a direct track to bolstering brand engagement. Is your brand taking advantage of the power in an Instagram hashtag? Once you have the hashtag covered, there's still the caption to consider! Check out our list of Irresistible Instagram captions from the world of eCommerce. Hashtags are more than just a catchy phrase to keep your company top of mind – though this is a bonus to the concept. Their more pivotal marketing function is literally acting as a virtual trail, leading users to your brand and your brand back to your users. So yes, they are memorable words that connect people on related topics, but their significance for brands on Instagram is so much more. First and foremost, Instagram hashtags give “audiences an organic way to discover branded content through the topics and forums that interest them.” The critical word here being: organic. Social media users are growing tired of pushy marketing that accosts them into engaging with the black hole of a brand. The truth is, they do want to engage with branded content: 65% of the top-performing Instagram posts feature products. But users want this content to enter into their lives by their own choice. So how can you set yourself up as a brand worth engaging with? I think you know where I’m going with this. There’s a lot of power in a hashtag. But that doesn’t mean a lot for a brand if no one is using yours. When developing an Instagram hashtag, creative word choice is important; remember, the simpler the better. But, more importantly, view the hashtag as something larger than just a grouping of characters. Finding the perfect hashtag is about leveraging your Instagram and brand image and turning that into addicting word bites that people want to use on their own account. Calvin Klein made more than a hashtag with their simply addictive #MyCalvins. It has become a sort of lifestyle or, as they frame it, a family. A lot of this is obviously dependent on your product and brand, but it also heavily relies on your content and marketing strategy. Put your focus on developing your strategy with hashtags in mind, open another communication channel with your customers and followers, and you’re on the path to unleashing their power. And you don’t need to be Calvin Klein to do it. Any brand has the potential to encourage engagement with their hashtags directly on their website and through social media. Once you are able to get people to actively use your hashtags, then you’ve found the key to the world of User Generated Content. Now, the power of the hashtag means more to your brand than just a way for your users to reach you. It’s also a crucial way for you to reach your users. And then turn that reach into active conversions. Bonus: Download our Whitepaper with expert advice on how to promote a brand’s hashtag on Instagram & Twitter! Put simply, when users post with Instagram hashtags, you can find their posts. Get premium users to include your hashtags on their posts, and you’ve opened the door to your User Generated Content database. The UGC model is rich with advantages to take your brand to the next level. User Generated photos are 5X more likely to convert customers and 47% of the top performing content marketing teams rely heavily on it. Not to mention, users have elected to take part in the conversation when they chose to include your hashtag on their post. And, to reward them for their active engagement, they get to be featured directly on your brand’s website – completing the engagement circle. But the whole social publishing process is not possible without the powerful hashtag. By encouraging hashtag use, you’re not just supporting active engagement with your brand. You’re also generating new content, and the kind that users want to see during their shopping experience. Why? Because they created it. What does it look like in practice? Photoslurp collects your hashtagged content automatically and then, in real time with the brands stamp of approval, integrates it directly to the website shopping experience in the form of stylish galleries and product page carousels. Thus, delivering a more authentic user experience aimed towards conversion increase. Struggling to get a picture in your head? 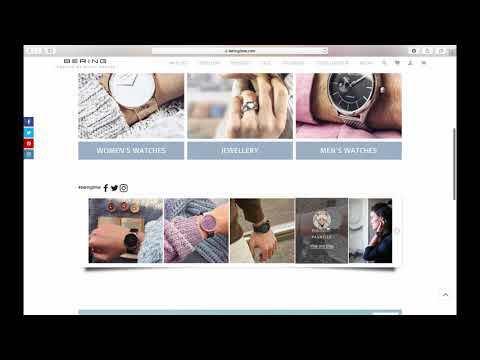 Take a look at the platform in action with our client Bering. And if you’re looking for some tips on how to create a winning Instagram hashtag, check out this resource with tips from experts! With all of these advantages, the Instagram hashtag really is a power move. Don’t let the vast expanse of social media swallow you whole. By leveraging a branded hashtag, you not only give your consumers a direct link to you, you also give yourself a direct link to them – one that will ensure that you’re brand engagement rates are reaching their full potential. With this connection, you now have access to your full line of User Generated Content, which can be integrated onto your website. Don’t miss out on what the current technology has to offer Instagram marketing today by harnessing the power of your Instagram hashtag. Let us know how powerful your branded hashtags are in the comments below! Charlie Brook is the Content Marketing Manager with Photoslurp. She's got words, and she's not afraid to use them.